Lot 908. 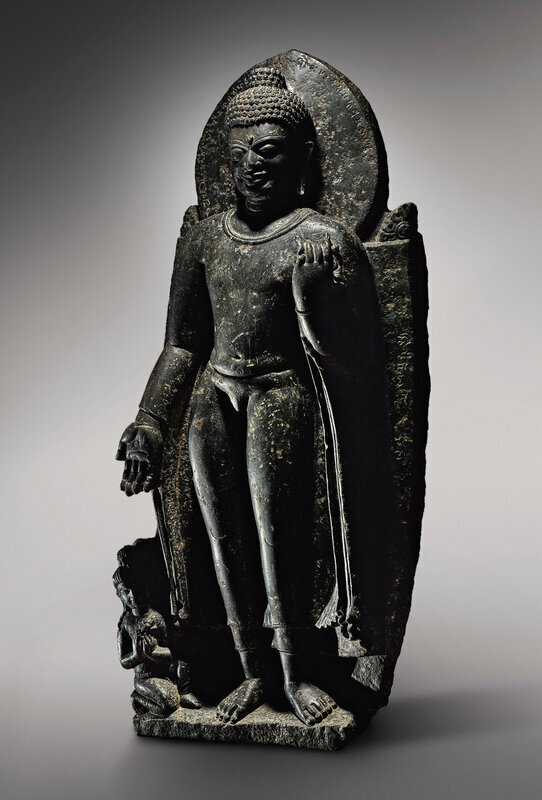 A large black stone figure of Buddha, Eastern India, Bihar, Pre-Pala, 7th Century, or early Pala period (c. 750-1200). Height 42 1/2 in. (108 cm.). Estimate 250,000 — 350,000 USD. Lot sold 250,000 USD. Courtesy Sotheby's. 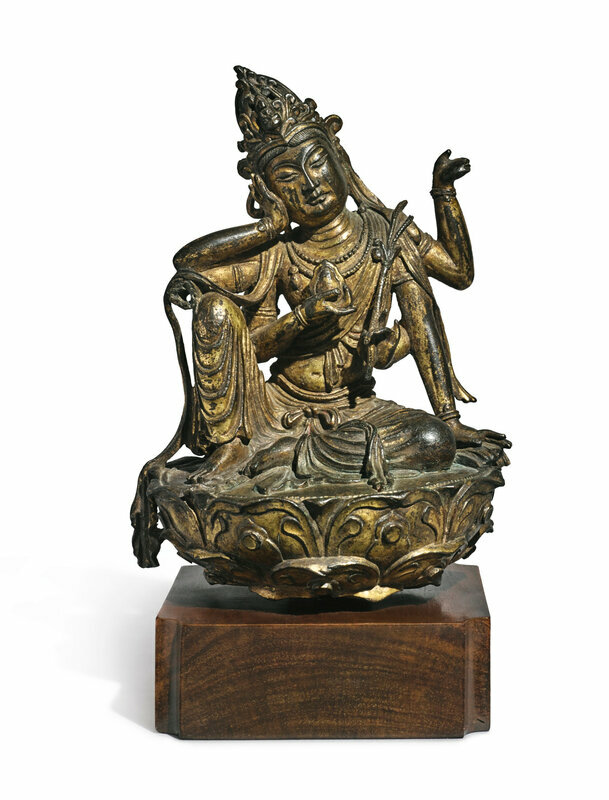 the Buddha with his left hand raised holding the hem of his diaphanous robe, the right lowered in varadamudra, standing on a rectangular plinth in slight abhanga against a gently curved and tapering backplate with ratna finials, a halo surrounding the head incised around the rim with Buddhist creed continuing down the right of the backplate, Maitreya kneeling below in adoration with hands in anjali mudra holding the stem of a lotus, and hair drawn up in jatamukuta. Provenance: Christie's New York, March 21, 2007, lot 245. Exhibited: New York, Asia House Gallery, The Evolution of the Buddha Image, 1963, cat. no. 18. Literature: B. Rowland, The Evolution of the Buddha Image, 1963, pl. 18, p. 132. F. Asher, The Art of Eastern India, 300-800, 1980, pl. 146, p. 77f. 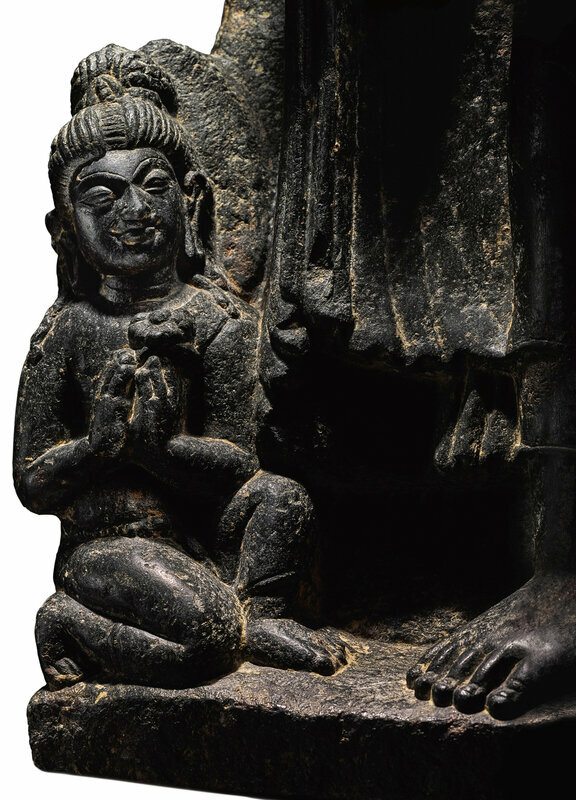 Note: This important eastern Indian sculpture depicts the historical Buddha Shakyamuni worshipped by his successor Maitreya kneeling as an ascetic in adoration at his side. Two other eastern Indian sixth to eighth century black stone examples of this rare iconography were unearthed during construction work in 1861 from the site of an ancient monastery at Sultanganj, Bihar. One, dated to the sixth or seventh century pre-Pala period, is now in The Avery Brundage Collection in the Asian Art Museum of San Francisco and shows Maitreya kneeling at the left as in the present example, see Susan L. Huntington and John C. Huntington, Leaves from the Bodhi Tree: The Art of Pala India (8th-12th centuries) and Its International Legacy, Seattle and London, p. 123, pl. 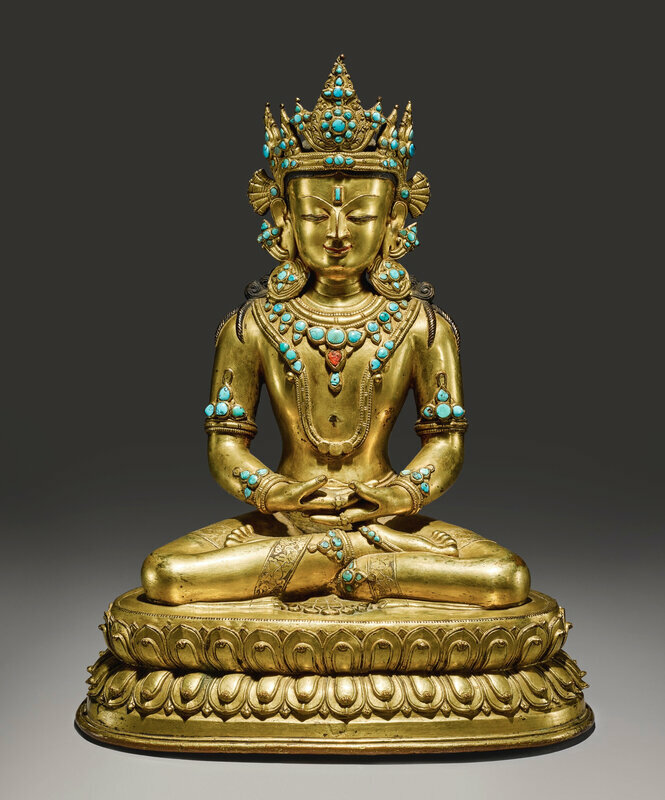 1: the other, dated seventh or eighth century, now in The British Museum has the future Buddha kneeling at the right, see Zwalf, ed, Buddhism: Art and Faith, London, p. 105, cat no. 139. The diaphanous robe with simple ribbed neckline and the subtle abhanga of the present example echoes the classical Gupta aesthetic of fifth century buff sandstone sculpture from Sarnath in Uttar Pradesh, cf. a standing Buddha with right hand lowered in varada mudra in The Golden Age of Classical India: The Gupta Empire, Paris, p. 181, cat. no. 25. Black stone is however the common medium for eastern Indian sculpture as seen in two circa seventh century seated Vajrasana Buddhas from Bihar in a similar style to the present example, with muscular physique, ratna finials on the backplates and simple undecorated pedestals, wearing similar diaphanous robes but off the right shoulder, see Susan L. Huntington, “The Pala-Sena” Schools of Sculpture, Leiden, 1984, pls. 8, 15. A late sixth or seventh century black stone sculpture of Shakyamuni Buddha’s First Sermon from Telhara in Patna district, Bihar, depicts the Buddha wearing a similar diaphanous robe with the same style of ribbed neckline as the present example, and small figures of standing Buddhas either side of the halo in place of the ratna on the backplate, ibid, pl. 14. The present example has more stylistic features in common with these sculptures from Patna and Gaya districts than the two Sultanganj Buddhas of the same iconography, although all are of the same Pre-Pala or very early Pala periods: compare also the muscular physique, gentle abhanga and the treatment of the knees, delineated by a simple incised crescent, of a seventh century bodhisattva from Nalanda in Patna district, ibid pl. 123.